construction worker Great product design. I work construction and the slits below my nostrils do allow for my safety glasses to not fog up. Also, the holes over my mouth allow for me to breathe comfortably without this area collecting moisture. With other products this area freezes or forms ice crystals. schnitzel I bought this product in Dec. 2010 to use specifically for a ski trip I was headed on out west in Colorado. My ulterior motive was for winter cycling. This product did wonders for my traveling via bicycle during a really harsh winter in the midwest. I don't own a car and commuted to class and around town on the bike. The mask was the best filter of cold air to my face and lungs. The venting holes are great to make it easy to breathe. This product was great everyday, and all day, while I was skiing. A few times as I was cycling and breathing heavy, my glasses tended to get a little bit fogged, but repositioning the glasses alleviated the problem. Sometimes condensation from your breath would occur and make the venting hole area a little damp but I never found that too be too problematic, as the material dries quickly once inside. Jon The only mask you should ever use. The comfort is pushed to extremes and the mask just wraps around all your face as tightly as you'd want all over it. With no pressure spikes anywhere. The wind simply can't pass through and although it's lightweight and thin, it protects like CRAZY. I've had 8 hours of incredibly chilly snowboarding in a row without anyone seeing my skin: I never felt like I had to put down the mask. It'll also cover your all your neck, so just put on a beanie, then wrap the mask tightly and you're good to go. LOVE IT. S S Robert The only mask you should ever use. 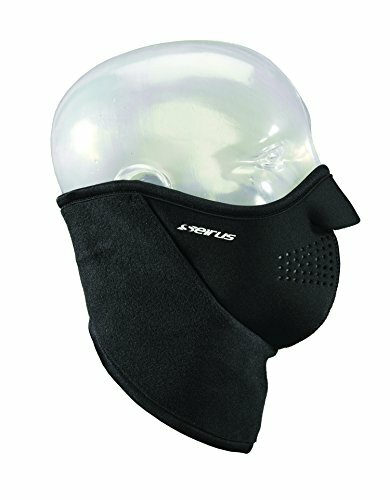 mist on your google or glasses this mask protect you from cold, very easy to breath and still keep your visibility clear. DangerZhang I'm using this for winter riding on my motorcycle and it does the job well. The fleece neck scarf works very well to stop cold wind. If you are using it for a similarly windy activity, make SURE you get a SNUG fit in the mouth area. 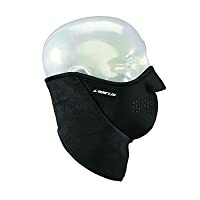 If the neoprene is against your face it prevents cold air from passing over your skin and you'll get great insulation, but looseness in that area will cause your mouth to get cold fast if there is a lot of wind chill. Highly recommended, so far I've used it into the mid 30's with good results. PhantasyIV Used this product for two years. Usage stopped when the item I possessed went missing. Durable, totable, and above all, effective. However, due to frequency of use, the velcro started to wear out towards the end of the second winter. FREEZER WORKER I work in a freezer with temps below zero F,and this mask keeps my face and neck warm and dry, most of the air I inhale has been warmed because of the mask, otherwise I'd be inhaling subzero temp air directly into my lungs,it is a nice and secure fit around my face, I've been wearing this type of mask for about 7 years, I replace it every 2 years because of the velcro wearing out and the mouth air vents starts to break,which is normal wear and tear,overall this is an excellent mask for cold weather environment. horsebackrider 925 I wear my Neofleece combo scarf during all winter outdoor activities. It does a great job of keeping my neck and my face warm. It is really comfortable. Easy to breath through. Works well with my normal attire. Would highly recommend it to anyone who enjoys being outdoors but can't stand to be cold. PolishAlexx Product worked great as described, my face wasn't burning after a day of snowboarding. Comfortable, lightweight, very breathable. Barely feel it on overall it did its job having the neck attachment IS Recommended, it helps that as well to stay on and your jacket being slightly unzipped. If worried how it looks you can easily put a bandana on it as a lot of snowboarders do.